This is the first article in our Guide to Suit Style. You can see the full contents so far, and browse between them, on the right-hand side of this post. What’s the difference between bespoke, MTM and RTW? The revival of menswear in recent years, driven by a combination of enthusiasts, innovative menswear companies and internet communication, has meant that whether a man is looking to buy a single suit or an entire wardrobe, he has never had so many options. Unfortunately, that choice is often obscured by brands and their marketing – particularly when it comes to differentiating between bespoke, made-to-measure and ready-to-wear suiting. This difference is neither incidental nor arbitrary. It is crucial to the consideration that goes into buying a new suit, and can be tightly defined. What is ready to wear (RTW)? A RTW suit is bought off the rack, in a cut and style determined by the designer. The development of the RTW suit was pioneered in the 1950s, when manufacturers segmented the male form into different sizes for mass production. The vast majority of the world’s suits are now made this way. What are the benefits of RTW? 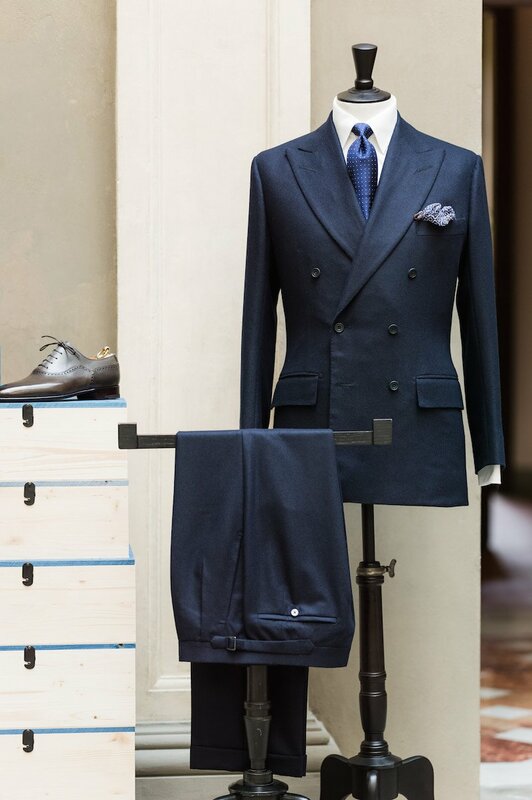 Immediacy: Each RTW suit is pre-made to a generic size and specification. So as long as you are happy with the size and style, you can purchase a suit off the rack that fits and take it home that day. No need to wait; no need for multiple fittings over several weeks; no need to imagine what the suit might look like. Relative affordability: The nature of mass production means RTW suits are usually the most affordable, and the growth of menswear also means there are a lot of RTW choices. The increased quality of construction, use of details once reserved for bespoke, and large range of fabrics means RTW is no longer limited to trendy suits with glued lapels made up in drab, cheap fabrics. 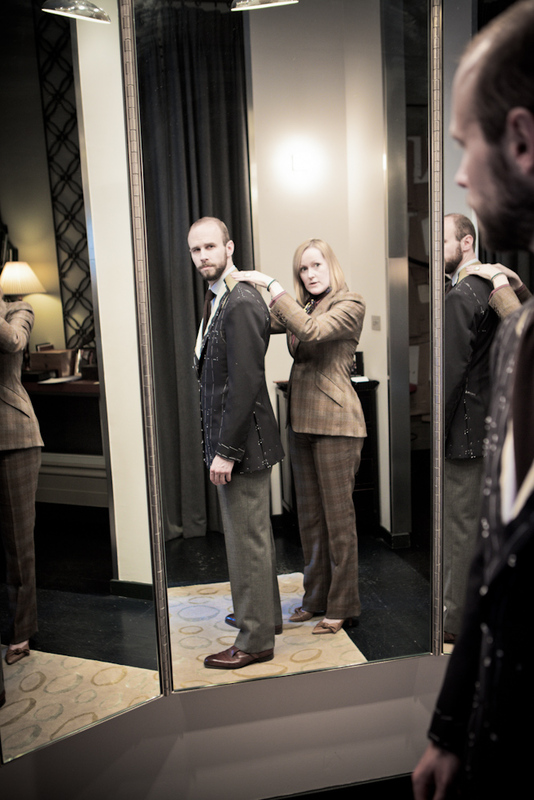 Better RTW suitmakers tend to be differentiated by the time they put into their suits. Indeed the very best (eg Kiton or Cesare Attolini) are largely handmade, although the extra work tends to go into finishing that the customer can immediately see and appreciate (hand-sewn buttonholes) rather than more fundamental structuring (hand-padded chest). What are the drawbacks of ready to wear? A pre-defined fit: Despite these benefits and the advancement in quality, detail and construction, most men run into the inevitable issue of fit. Even a rudimentary list of measurements such as chest, shoulder, sleeve length, waist (for both jacket and trousers) and trouser length, illustrates that few men are likely to possess the dimensions to fit a RTW suit size exactly. So while a suit may fit well in some areas, it may be too long, short, loose or tight in others. For this reason, we would always recommend having a RTW suit altered, if only slightly. Little personal expression: Another aspect of RTW is that the suit is imagined for you, so if a store doesn’t have the colour, cut or fabric you’re looking for, you’ll need to look elsewhere. What is made to measure (MTM)? The MTM suit is like RTW, but with the benefit of an altered fit. You visit the store, but instead of taking a suit of your choice away that day, the salesman takes a few measurements and choices in cloth and style, they are sent to a factory (usually the same factory where the RTW is made) and the result after a few weeks’ wait is a suit cut to your personal dimensions. The chest, waist, sleeve length, trouser length and trouser waist are all yours. What are the benefits of made to measure? Greater scope for personal expression: One interesting aspect of MTM is the cloth, buttons and other trimmings available. In some ways, the offering can be wider than bespoke. 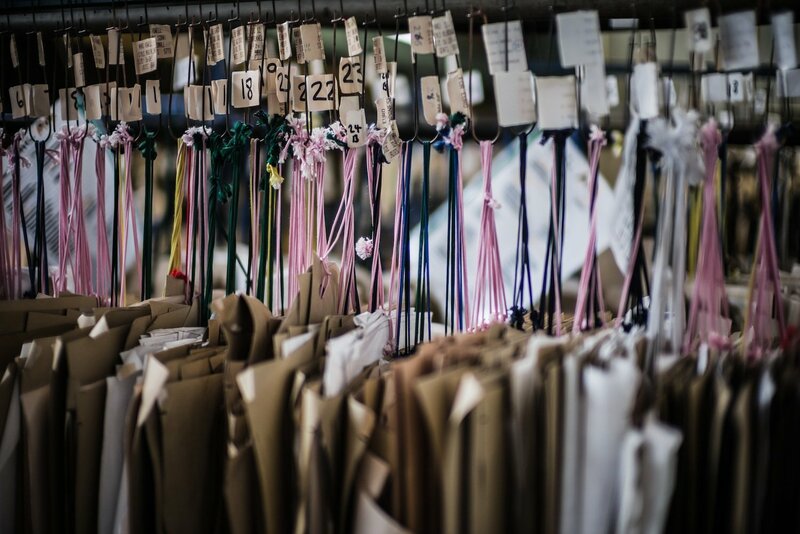 The cloths are often more original than most of the bunches cloth mills supply to bespoke, because the MTM brand is closer to RTW, where cloths are usually more experimental. They are also often exclusive to that brand, again as with RTW. With the resurgence of interest in personalisation, high-end MTM has also become more widely available in recent years, particularly among Italian brands that don’t do bespoke (Brioni, Caruso, Pal Zileri, Canali, Cucinelli etc). The best of both worlds, right? So in MTM we have the (near) immediacy of RTW, especially in contrast to the months taken for bespoke. Similar (if not greater) options for cloth and finishing, at a price point closer to RTW than bespoke. And personalised measurements. It sounds like the best of both worlds. What are the drawbacks of made to measure? Better fit…to a point: Even MTM suits that take into account a dozen or more measurements rarely fit as well as bespoke. Imagine the long, S-shaped curve of your back (image below). How many measurements does it take to recreate that? MTM only really deals in simple, flat, two-dimensional measurements. It can make the length of sleeves correct, but it cannot account for how much you stoop or which shoulder is lower than the other. A salesman can be good…but he’s not a tailor: The other problem with MTM is that the fitting is done by a salesman, not a tailor. So while the potential of MTM is quite large, the result often doesn’t fulfil it. Unless you are an unusual size (eg tall with very long arms), a RTW suit altered by a good tailor will often fit as well as a MTM suit of the same price. The only remaining advantage of MTM is that you can pick your material, lining and style. For some, that is significant. Chittleborough & Morgan bespoke suit. Bespoke, as regular readers will know, involves creating a suit from the ground up. 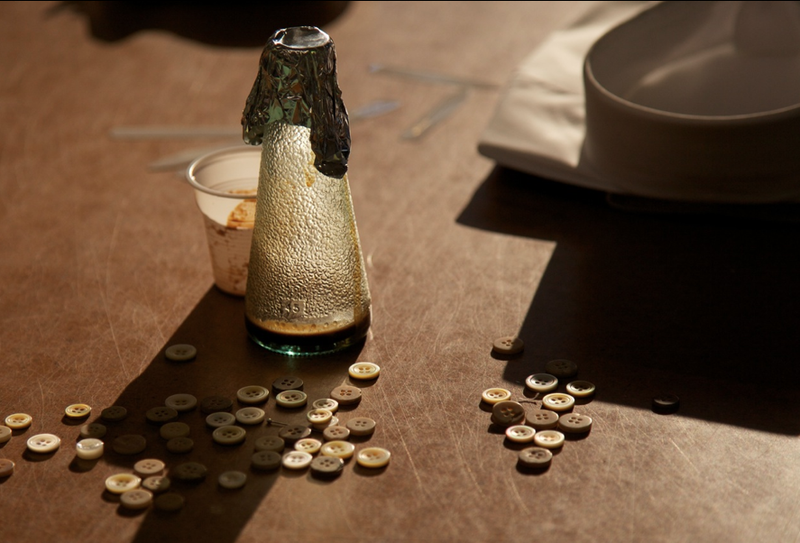 It can take any form, any shape, any material, and is usually handmade by two or three tailors. The process begins with an initial discussion as to your needs (what type of suit you are after, your ideas on the style and cloth if any, and the ways and occasions you may have to wear it). 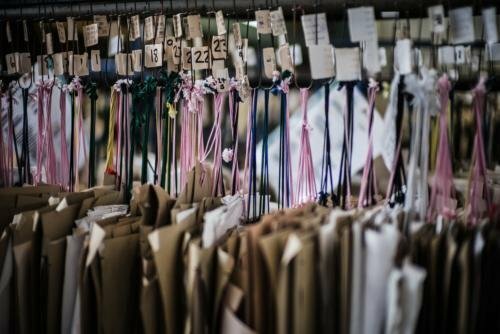 The tailor then takes your measurements – a seemingly endless number, with detailed notes that take into account aspects of posture and body shape that only a trained eye could notice. A set of bespoke paper patterns is then drawn and cut (some elements by eye), with the cutter using his measurements and notes as a guide. The cloth you’ve chosen is then cut using these patterns, and over the course of several fittings the fit is refined to the final product (usually between two and three, but potentially more until things are right). What are the benefits of bespoke? 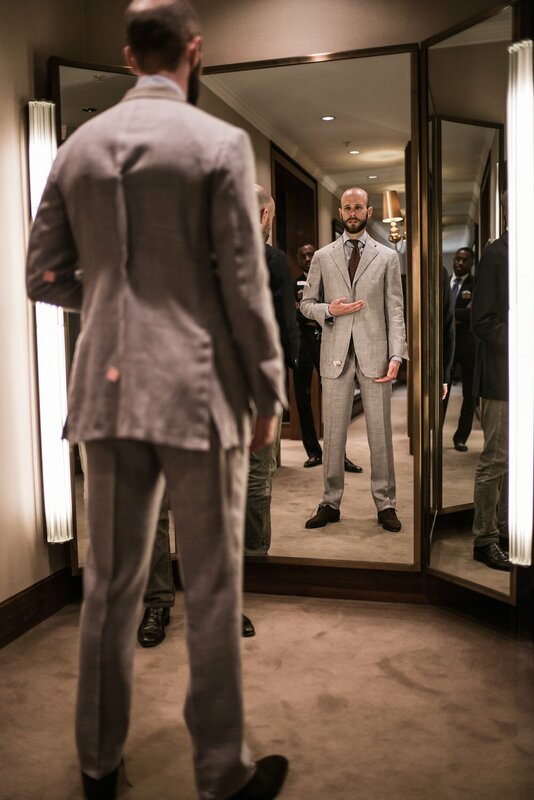 Superior fit: Clearly, the biggest benefit of bespoke is the fit. While there is enough detail on fit to write another whole guide, suffice to say that a good bespoke suit should fit like nothing else. It should hug your shoulders, create a clean back, and run in a sharp, flattering line from shoulder to waist. It will also often be more comfortable. Longevity: The work that goes into everything from the lining of the waistband to the stitching of the pockets means the suit should last longer than anything mass-produced. That handwork also makes it easier to adjust over time, and it will be adjusted by someone that has served you before and is familiar with your body and your style. Unlike a salesman who is likely to change every year. Total creative control: Bespoke also offers the opportunity to develop a truly individual garment, not just in shape but in material, detail and finishing. While your imagination is the only theoretical limit, a good tailor will also use their experience and sense of style to help guide you in pushing those boundaries without going too far. First-timers often make very showy suits, and then barely wear them (despite it being their highest quality and best-fitting). What are the drawbacks of bespoke? Timing and expense: Bespoke takes time. Typically a first suit from a tailor will require three fittings, each a few weeks apart. Some positively enjoy this process, but it’s not for the impatient. And it’s expensive: a bespoke suit can cost anywhere from £1000 to £6000. It won’t be perfect the first time: Some people have their first bespoke suit made and think that, because they can change everything, it will be perfect. But there is such a thing as too much freedom. You’re opening the creative floodgates, stepping outside the mathematical rigour of mass production. It’s great fun, but there will always be things that you want to change six months later, if only because you only slowly realise what you wanted in the first place. Tailors also refine their pattern over time. So there’s a good chance your second suit with a tailor will fit ever-so-slightly better than the first one. The first will still be better than RTW or MTM, but in that sense too it won’t necessarily be perfect. While I’ve outlined three distinct categories, the difference is not always clear cut. Some RTW is made better than some bespoke (eg Kiton has more handwork than Graham Browne). MTM comes at hugely varying price points and quality levels (anywhere from £300 to £4000). Bespoke also varies a lot in quality of finishing and design. But in the end, you buy RTW for the design and the price. You choose MTM when you want to change the fit and to personalise the suit. And you choose bespoke when you want a mixture of the best fit and the best quality. For me, fit is always the most important thing about a suit, as it has such possibility to flatter a man – to make him look leaner, stronger and sharper. That is the biggest reason to choose bespoke. Quality and design should be considered separately. You can follow the discussion on Suit style 1: The difference between bespoke, made-to-measure and ready-to-wear by entering your email address in the box below. You will then receive an email every time a new comment is added. These will also contain a link to a page where you can stop the alerts, and remove all of your related data from the site. What an indispensable article! I know this will be a hit with all readers. A brilliant article that perfectly shows the good and bad of each category. One thing that I would like to add is the impact of the house style of the tailoring house. I know this is something you mentioned several times in other articles and I believe one of the reasons people get disappointed with their first bespoke commission is that they have a vision of something completely different than the tailor is know for. It could be someone ordering a Neapolitan sport coat from Huntsman or just as likely trying to achieve the look of a Tom Ford Tuxedo from Solito. I think in that way it is equally important to choose your tailor like you would choose your RTW brand because there is only so much a tailor can (or will) change from his house cut. And if they would, the result is rarely a good one since it´s not something they´re known for. Thanks again for a very nice article. A great article again. Unfortunately I don’t quite have the budget yet for bespoke, so stick to MTM/RTW with alterations to ensure the best fit possible for my budget. I do have one question – I’m not entirely sure if this is the correct article to ask this, however, what is the best way to distinguish between horn and plastic buttons in your opinion? Hi Simon, this is a great post – well done. I would add that spending some money on improving your silhouette (gym/diet) before spending anything on bespoke, MTM or RTW will always pay off – no amount of tailoring (however skilled) will totally mask an individual’s physical shortcomings! Good that you’re writing these guides! Very useful. There seems to be a trend of offering that continue blur the line between made to measure and bespoke. One I’ve experience with is Sexton’s made to measure. Still a custom pattern with the same endless (actually seemingly more!) measurements, but definitely a level below Sexton’s bespoke. Comparing against bespoke jackets I have from other tailors, the Sexton m2m definitely has less handwork which has some effect. However the hand finishing it does have (buttonholes etc.) is just as fine. More importantly, the fit was just as good. You also mentioned Manning & Manning’s semi bespoke – another example of blurring the line. Very good article, look forward to reading the rest of the guide to buying tailoring.. Fantastic article. Does anyone have any insight into Knot Standard (their showroom process/not the website)? Have narrowed down next suit to come from my one-man tailor, spoon tailor or them? I actually believe this one man tailor (Jacky Tailor) is really skilled but concerned about communication. thanks! I would advise anyone thinking of going down the MTM route because of cost to choose a tailor that offers both bespoke and MTM.A proper tailor should achieve a much better fit in MTM than an ordinary retail outlet.Also,ask your tailor if they think that MTM will be successful in their particular case…some body shapes are better catered for by choosing bespoke. A bespoke tailor who offers MTM as a second string would, in my view, give you a much better result than an outfit that specialises in MTM only, as they will have a clear view of how bespoke can and should fit. BUT, and its quite a big but, the fit will ultimately be determined on how the factory where the MTM is made can manipulate the pattern based on the measures taken by the “tailor”. As MTM can and is made pretty much anywhere, including eg Mauritius, it is this and this alone which will determine the outcome. Machines these days can make “hand” buttonholes and mimic a lot of the other stuff that “looks” like hand finishing, but it all comes back to the fit. I have some MTM from some of the biggest “names” which is, frankly, rubbish, but I have some MTM which is made by true bespoke tailors which fits brilliantly, but does not have the hours and hours of labour associated with real bespoke, which is why it is so much cheaper. Where will you MTM come from? Indeed. It’s one reason I usually recommend MTM as just a small step up from RTW. You know what you’re getting more. In the end, you can only deliver what you can control. When the MTM garment is tried on for the first time it is unlikely it will fit perfectly.It should then be appraised by your tailor who will then have the suit adjusted until a good fit is achieved.This should take no more than two fittings. Simon, you’re emphasis on fit as the most important factor is absolutely correct. My experience is that as long as there isn’t some significant anomaly in a man’s body,mtm can fit extremely well. As always , taking the proper measurements is the key. I use a private atelier who takes excellent measurements and has identified several manufacturers that have decades of experience with mtm, superb taste levels in terms of fabrics and models, and fantastic workmanship. The fit of a mtm Belvest or Zegna suit for example is very impressive, will last a long time, and cost a lot less money.. Of course the bespoke experience is wonderful, but not necessary for most people. Simon, very informative and fascinating article; very timely also for me. Having done some research into having a bespoke blazer and trousers made I find this marketing of “bespoke” , “semi-bespoke” etc very misleading and confusing when sometimes what you are getting is frankly M2M in a different guise. Could you include at some point or direct me to the differences and merits of half canvas and full canvas; is it simply a cost thing or are there differences in quality of fit? Also if you or your correspondents have any experience of Alexandra Wood’s tailoring I would be grateful. Many thanks, always look forward to the next post. If RTW jackets fit pretty well from the off – what’s your view on wearing the jacket for a couple of weeks before getting it altered? I find this preferable when the sleeves etc. only require 1/2 to 1/4 inch adjusting. I agree that fit is the most important thing. But I would argue that bespoke not always is the best option. If you have a normal body a rtw with alterings or mtm can be overall better if you compare high end italians with cheap bespoke. I definitely prefer altered Attolini to Graham Browne. There is another option: Thrifting. I have commissioned bespoke from a few tailors in the past, and still do. But I’m also quite happy to buy things second hand, often online. I’m lucky in being a fairly normal shape (albeit largish) and so can generally pull on a jacket or suit of the right chest size. I then take these to an excellent alterations tailor and spend anything up to a few hundred pounds having them skilfully altered. Obviously there have been a few that simply couldn’t fit (just sell them on again), but it’s surprising what a talented tailor can do. As long as the items are bespoke in the first place – there’s less chance of significantly changing a MTM item. I’ve found the thing to do is be open to what is available, buy it if you like it, and be brutally honest about whether it’s likely to fit. Standard types of things tend to be better than the crazy one off items. It’s also the only way to buy real vintage items. This is simply incorrect or dated information. Stooping and erect postures, as well as individual shoulder adjustments, can be done in MTM. Of course, this needs a good MTM system and a knowledgeable measurer, but it can be done. Of course, the older systems offered very little control over the patterns, usually concentrating only on sleeve- and jacket length. Nowadays, gorge height & similar details and the basic “model” are usually not alterable, but pretty much every measurement and posture alteration can be done. Otherwisely, a very good post and an article I’d recommend my customers to read. Thanks. In my experience, some MTM systems do claim to be able to deal with these changes, but the effect is very imprecise. It’s like ticking one of three options for ‘regular’ ‘square’ or ‘sloping’ shoulders, where a tailor is actually measuring the difference – and more importantly, adjusting that on a basted fitting, pulling it apart and re-pinning. It shouldn’t really ever be compared to bespoke. Agreed – I don’t compare it to bespoke. However, the options can be made more varied. It is very different from bespoke, but accommodating, for example, a lower, forward-tilted right shoulder (and giving the amounts in millimeters instead of ticking boxes), adjusting sleeve pitch, shaping back to accommodate a higher shoulder blade on other side etc. are rather common in better MTM systems. Of course, there are limits to every system, but the better ones are not bad. Also, it is, of course, down to the personnel using it. It is necessary that the person taking the measurements knows quite a bit about tailoring (certainly not something that can be taught to the shop clerk in one hour). After initial fitting, then, adjustments have to be made (those are most commonly minute adjustments for sleeve and trouser length and so on) and, optimally, a proper pressing has to be done. That way the suit fit should always be better than with the fitted RTW. It shouldn’t be compared to bespoke, but it still isn’t as crude as described here. And the second suit shall be better than the first one – this, usually, applies to bespoke as well. And, as always, be it RTW, MTM or bespoke, one should “shop the shop”, i.e. find the one with a style that best fits the own sense of style and get a salesperson/measurer/cutter that he trusts. Thanks. You must have much better MTM experiences than myself or the many people in the industry I know. If you can describe a forward-tilted right shoulder to a MTM system and get it to work, that’s great. Absolutely fantastic! On a separate note, do you have a recommendation for where to take your suits for that occasional dry clean? There doesn’t seem to be any mention elsewhere. Thanks! A very useful post indeed! Yet it’s bewildering when one considers the amount of knowledge actually needed to reach even the level of MTO, and to taking full advantage of the range of possibilities available at this level alone! Even relying on RTW involves a great deal of knowledge not always provided by haberdashers. So surprisingly enough, the whole process is actually exacting, time consuming and hence necessarily incremental! It’s a good question. Generally the good tailors will not be more rushed with foreign customers. However, they and the customer are often tempted to miss one fitting in order to get the piece quicker. I would recommend against it – make it clear to the tailor that timing is not a concern, and if they really care about the final result, they will likely have one more fitting if it is needed. I like British style and I’m gonna commission my first bespoke suit with a Savile Row tailor. I have got one tailor in mind, but my request is slightly different than their style: I want a full chest rather than his clean chest style and a more straight skirt. Apart from that, I like most other aspects of their style. Do you think my request is too much? Not necessarily drape cut, but full, swelled chest like Henry Poole or Dege & Skinner. I prefer that later one since the have more structured shoulder. However, the lack of reviews about them and their conservativeness prevent me from starting to commission a suit with them. Btw I saw on their instagram that you just commisioned a suit from them earlier this year. I wonder if you’re gonna write review about them. If no, can you give me some brief review, especially the back of the suit where many tailors failed to make it clean? Moreover, i have a small suggestion about your review on suits. In my opinion, you should take a picture of the whole suit alongside with pictures of details. I do understand that picutres of details show the craftmanship of the tailors, but i believe photos of the whole suit (i.e. taken from the back, the side and the front) will bring readers a view of silhouette which is a very important aspect when we commission a besopke suit. You usually took this kind of photos a lot in the past, but becoming less recently. Thank you and have a productive wwek. I didn’t find that my Poole suit had much of a swelled chest, perhaps just a touch. And similarly with the Dege, which I will write a review of, yes. An excellent article, thank you Simon. Could you give some tips on choice of fabric please. Should I go for 100% wool, a wool/cotton mix, wool with silk and should polyester ever be considered as by some RTW manufacturers ? In fact, most MTM programs can make literally dozens of adjustments inclusive of accounting for a stoop or low shoulder (or high shoulder) My program even takes into account a high hip, sway back, numerous options to adjust the trouser seat, back, shoulders, different levels of shoulder padding, full canvas or half canvas or totally unlined, adjusting the actual width of cloth around the biceps and arms, and dozens more. The fact is most men would not benefit from the added expense of bespoke if they have relatively normal bodies. Have you actually sat down and looked at a comprehensive MTM’s computer software to see the micro-adjustments available on a block? Hi David, yes I have. And I had this conversation to an extent higher up in these comments. In my experience, although MTM can attempt to correct these things, it never comes close to bespoke – to the adjustment of cloth on someone by an experienced cutter that will then re-cut that cloth himself. It is as a comparison to bespoke that that description is made above, and I stand by that these are the only things that can be changed as well as bespoke. Hello Simon – I’m 60 years on; 2 months on visiting Permanent Style. Terrific site, just plain terrific. Here’s the story: last 40 years always bought high-end off the rack suits. Great fabric. Great tailor(s) to tweak. Otherwise, cuff ’em (turn ups) and out the door. No probs. Commissioned my first bespoke suit 3 years ago off the Row and have only one regret. A very major regret. I should have gone to the Row 40 years ago! As you have said, nothing comes close to bespoke (commissioning my 5th suit v soon). Long time reader, first time to comment. Really appreciate the blog. Very informative and well written. 1. Do I understand correctly that the main and most important difference (in terms of process, at least) between MTM and true bespoke is the creation of an entirely new and unique (paper) pattern for the client? 2. If so, then which of the tailoring houses can claim to make true bespoke? I have heard from some menswear tailoring “insiders” that it is only the high-end Saville Row houses that can claim to be true bespoke makers, in the sense that only they create new, unique, from-scratch patterns for their clients. 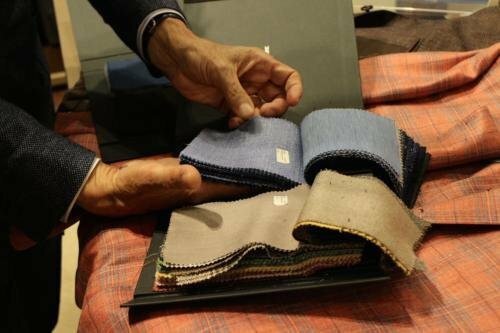 And most (if not all) Italian houses (including some high-end ones that claim to make bespoke suits and are highly touted in the menswear industry) do not really make true bespoke, since they start from pre-made paper patterns, which they merely adjust, thus making them closer to MTM rather than true bespoke. 3. Is this even a relevant issue? It can be argued that, if fit is the most important consideration, it really does not matter how the tailor gets to the end result. 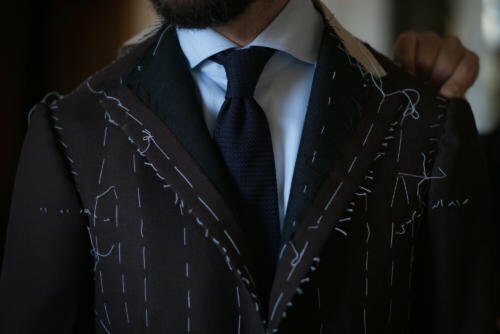 A bespoke tailor may have taken a hundred different and tiny measurements, created a unique paper pattern from scratch, and subjected the client to 10 fitting sessions and adjustments, but if after all of that, the fit is still off, then the client was still gipped, right? On the other hand, it can be argued that, this issue of marketing and branding is relevant, in the sense that it signals to the public what kind of service a tailor house offers and what the client is paying for. I would even dare to say that being able to claim true bespoke services would (should) be a great point of pride for tailoring houses. This is a separate, but nonetheless significant, issue from whether the tailoring house can deliver a good product. 4. If the issue is indeed still relevant, how can a client make sure that he is getting true bespoke? Even if one were able to inspect the backrooms of the tailoring houses, and let’s face it, most non-“insiders” do not have this opportunity, that does not really ensure that one’s garment will be done in the true bespoke manner. I hope you can make sense of my ramblings above, and I would truly appreciate your thoughts on this. Thanks. Really appreciate your reply. So, I guess from the buyer’s point of view, the additional amount one pays for when ordering from a bespoke maker should reflect in the end product (regardless of whether the process was “true bespoke” or not). Would this be the same from the point of view of the craftsmen? Would a superior product necessarily trump any questions/concerns regarding whether their process is “true bespoke” or not? Thanks for your replies. More power to you and good luck in all your endeavours. I am working up to buying my first bespoke suit (having only used MTM in the past) but the part of commissioning a garment I dread the most is picking out the cloth from the swatches! I can research a style and note down the features I want from a garment to discuss with the tailor but I feel obliged to hurry up and choose a cloth when really I’d like to sit for an hour and flick back and to through a whole bunch of swatch books and then maybe go home, mull it over and come back for another nosy! Is it possible to do this anywhere in London? I’d like to take my time and not have a salesman hovering close by making me nervous. I am a long time reader of your blog. As someone who is very knowledgeable about all things sartorial, I wanted to pose a question to you (that my wife asked me). About a week ago, I went to a local shop in Washington, DC to pick up a MTM jacket. I was speaking with the owners of the shop and discussing my perception that there has been a recent uptick in similar shops in the area that have nice storefronts and focus on MTM and/or bespoke options that are priced appropriately for working professionals. My wife asked the owners if they had any suiting options for women, and they indicated that it was not something that they offered. As we left the store, my wife shared her frustrations with me- that there really weren’t many options that she was aware of for MTM / bespoke women’s options as far as sportscoats / suits were concerned. She quipped that she thought it was related to the general perception that style trumps substance as far as women’s fashion goes and that women wouldn’t spend money on conservative, well made clothing that wasn’t overly “fashiony”. As far as she was concerned, there is a significant number of women in cities like Washington, DC, New York, or London that probably would pay for quality fabrics and proper fit…. and yet neither of us are aware of any such shops (atleast in DC) that target women like her (20s/30s, professional, and interested in fit, quality, and style). So the general observation here, simply put is: It appears to us that men have significantly more options as far as MTM/Bespoke tailoring goes, even though both genders wear suits in today’s professional environment. Do you have any thoughts about why this might be the case? Is it simply a lack of knowledge on our part, or something a bit more nuanced about the industry? As frustrated as your wife may be, there have been many attempts over the years to launch MTM or bespoke offerings for women, and it’s always a very hard market to make money in. Partly this is because women generally want to spend more on design rather than make, as you say. Men’s low-end suit companies thrive, for example, despite the fact so few men wear suits today. But women’s brands struggle at this end of the market – more design, and therefore more of a brand, is usually required. This is also because women’s style actually varies quite a lot, even among pieces that might seem conservative. For example, if you speak to a bespoke tailor that makes for a lot of women – such as Kathryn Sargent – she will show you the design sketches that she has to take women through to work out what they want in a suit. The length of jackets, of lapels, width of shoulders etc, changes far more quickly and comprehensively than it does in menswear – which will usually decades to change across the market. Those makers also have a hard time because frankly most women want a suit that doesn’t fit. That visibly stretches across their waist, that is so short in the jacket it’s the same length as a waistcoat, etc. The tailors will say it’s often much harder convincing women they want an elegant, tapered fit than it is for men. If your wife is interested in bespoke, there are many good tailors out there who offer it, like Kathryn. But MTM in particular always struggles. I’m new to the bespoke/MTM market, and I stumbled on your article the other day. Unfortunately, I didn’t find the article until after paying $2,150 ($2,360 with tax) for a 3-piece MTM suit from Martin Greenfield Clothiers in NYC. Greenfield has a good reputation and uses high quality fabrics (Scabal super 130s in my case) but doesn’t make the suits from scratch and doesn’t offer true bespoke suits. (1) What’s the difference between a MTM suit from a place like Greenfield’s and a RTW suit with alterations by a good tailor? Is there any difference in the degree of customization or quality? (2) I honestly didn’t understand the difference between MTM and bespoke when I purchased this suit, and thought I was getting a bespoke suit. 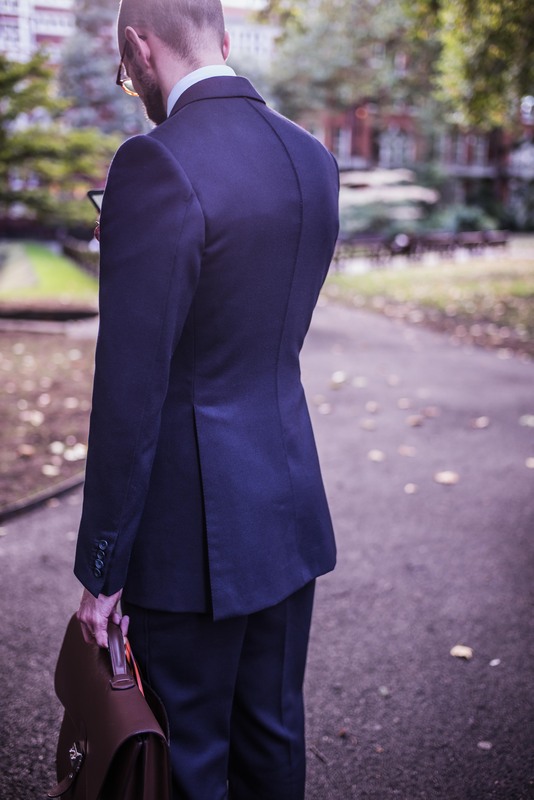 How much should I expect to pay for a true bespoke suit with quality fabric and workmanship? Thank you for your time, and for the very helpful article. 1) The quality of the tailoring depends entirely on the suit makers. Some RTW and MTM is made very well, some less so. Look up my piece on how to buy a good suit. In terms of the fit, the difference is several extra changes. Alterations are more limited in changes to the shoulders and chest, for example. So it definitely sits above RTW even with alterations, but still below bespoke. 2) It varies hugely depending on the brand of the maker, their experience, their handwork etc. But certainly more like 4000 dollars and up. A 3 piece hand finished MTM suit in a Super 130’s Scabal from a top Savile Row house. made in the UK would cost around 3.5k pounds sterling so the price you paid at 1.8k pounds sterling is actually very good. Greenfield makes excellent suits. A top NYC tailor will charge a minimum of 4k US, more like 6/7k these days. Interesting, the part we you discussed some high-end RTW brands (eg Kiton or Cesare Attolini) seems to indicate that the handwork from these brands are more on the outward-decorating side. With regards to your comment, “a RTW suit altered by a good tailor will often fit as well as a MTM suit” I’ve been at a loss to find a good tailor in London willing to work on anything that hasn’t come directly from them in the first place. I’ve tried so many I’ve lost count and am beginning to feel that if the item of clothing was not purchased directly from a tailor, your only option is to deal with glorified seamstresses of dubious abilities. Surely this can’t be the case can it? Well, it often is. Alterations work does not make much money, but you take on a decent amount of risk in promising to alter something to a good level when you didn’t make it. Graham Browne still do alterations I think, and are very good. Check with them. who is the neapolitan tailor means the sartoria behind Shibumi Firenze Trunk Shows, responsible for the jackets and suits? I have been reading your blog post for some time, and it is one of my most enjoyable reads. There is little to no tailoring where I live, and subsequently there are almost no tailoring supplies here. The fabrics are mostly synthetic and cheap, and there is no canvas to be found. The tailor I do have said he knows how to create a canvased suit. I wanted to get some online, and have him to use it. That is when I stumbled into the world of cloth, linings, buttons, shoulder pads and all the organs of the suit. Trying to understand what goes into a suit and why, I searched online for a technical piece about the anatomy of the suit (what exactly is the difference between shoulder pads, what is the difference between different types of canvas), but found no such article or diagram. I thought this could make for an interesting post – a sort of grocery list to for bespoke suit – but I will gladly accept a even the shortest of explanations as a comment here. – how many measurements are taken by top Italian, uk, french tailors? – do they all deliver such a clean back as seen in the Chittleborough suit in this article? It almost could be seen as to neat, plastic made,…and nice. – why can a MtM fitting not yield the same result in the back, with alterations here and then all along the back line? Kilgour of Savile row is now offering what seems to be a pretty advanced MTM. Has anyone tried it? Hi Simon, relatively new to the finer points of tailoring and trying to decide between ordering my next business suit as MTM with a higher-end cloth (something like 11oz H&S Cape Horn) or, at about the same price point, going bespoke with the tailors entry-level unbranded and typically lighter (8.5-9oz) house cloth. Wondering if you have a preference or view on these alternatives from your experience? Would the potential for improved fit outweigh the benefits of better cloth? Thanks! Absolutely. I wouldn’t worry too much about an expensive cloth unless there’s something very specific you want. And fit is the most important thing in a suit by far. Dear Simon, I would suggest you Manolo Costa If you looking for best bespoke suits. I tried them, found them the best Men’s tailor upper east side. Very helpful article. Where do the cheap tailors of places such as Vietnam, Thailand and so on fit into this? Would they be classed as MTM or bespoke? Also, how about the mid-range Hong Kong tailors such as Edward Tam and Lee Baron? They actually tend to be all bespoke, both the cheap and more expensive names, in terms of making a pattern from scratch, doing work by hand and so on. The biggest making difference is usually that they use fused canvas. But they take little time over fittings – one fitting at most with the cheap ones, and nothing much is really changed at that point. The more expensive names will do more real fittings. Hello Simon, My budget allows me to look at RTW suits – possibly MTM. As such my yardstick starts at Suitsupply as it seems to offer “good value” but would like to consider other menswear options. Unfortunately, I find many RTW brands including the likes of Ralph Lauren are making short jackets with skinny lapels – not my cup of tea ideally. I am based in London and would be grateful if you could consider listing out some other options that are available to me in London/Europe. Thank you! Would you say Sexton’s Offshore Bespoke is closer to MTM or Bespoke? They say they “draft a unique pattern in the same fashion as a bespoke suit, assessing the client’s physique against the house’s blocks to make any adjustments required”, which seems a bit ambiguous according to your definitions. I think it’s closer to bespoke, given who is cutting it and, from what I understand, the level of adjustments being made. I’ve just commissioned a three-piece dinner suit from Sexton’s Offshore Bespoke, their take on MTM. I chose to do so because I think that the drama of Sexton’s style should work well for a dinner suit and because it provides a lower priced introduction to Sexton. I’m a relative newcomer to Bespoke, commissioioning my first suits and jackets within the last twelve months, but with much more experience of MTM (good and bad). So far I’ve commissioned bespoke garments from two tailors and been pretty happy with the results. For what it’s worth, given that limited experience, I was very impressed with my first meeting with Dominic (and Peter) at Sexton. It was an unhurried meeting, with lots of discussion of design/style points and a considerable amount of time spent on measurements, including a variety of fitting garments. The amount of time spent on measurements and evaluating the peculiarities of my physique (which seems to be largely an assembly of random spare parts!) was greater than my experience of bespoke tailoring so far (which were good and have yielded good results to date). I’m nervous and excited in equal measure about my Sexton MTM/Offshore Bespoke commission, but that first meeting was a very positive experience and has provided me with a degree of optimism about the outcome. I’ll still work with my other UK tailor, whose service and quality are excellent, as is their value for money, but if this Sexton commission lives up to expectations I hope to add a third (and probably final) tailor to the list. I’d be happy to provide an update on the final result if that would be of interest.